It’s rare for a player with as much ability as Mario Balotelli – which so often strays into the realms of bona fide genius – to see that unequivocal talent dwarfed by off-field antics; but that is the nature of Manchester City’s beautifully imprudent striker. The Italian wrecking ball swings from sublime to ridiculous, passive to impetuous, idiocy to genius – an asset to the opposition as much as his own team. Roberto Mancini has fought so hard to mould the 22-year-old, nurture him, but he may finally be losing his patience. 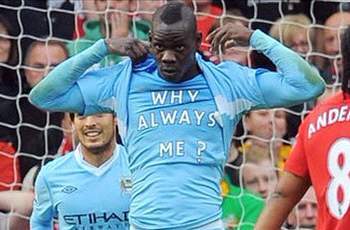 Balotelli has been excluded from consecutive matchday squads and publically criticised by his manager. And now, as revealed by Goal.com, French giants PSG are circling, ready to swoop in and lure the sparklingly glum paradoxical forward to Paris. The enigmatic man-child has spent the past few weeks on the naughty step, punishment for a lack of application in training, and watched from the stands as both Sergio Aguero and Carlos Tevez struck twice against Aston Villa on Saturday. Balotelli has found his playing time increasingly limited since Tevez’s redemption, starting just five games and yet to register a league goal. While Super Mario has moped on the sidelines, fellow reserve Edin Dzeko has applied himself, allowing his frustrations to fuel him; the Bosnian has started two fewer games than the Italian, but scored six goals. With Aguero and Tevez in such fine fettle, and Dzeko immensely prolific off the bench, it’s hard to ascertain what Balotelli’s role is within Mancini’s squad. That’s been further compounded by the former Inter Milan manager’s search for yet another jewel in City’s offensive crown. Fiorentina’s Stefan Jovetic has been heavily linked with City, while Mancini remains keen on Napoli’s Edison Cavani and Chelsea target Radamel Falcao. The Premier League’s most destructive firecracker, the naughtiest Messiah, has become surplus to requirements. From an entertainment and narrative point of view, his loss would be colossal. Balotelli’s made more back-page headlines for non-football reasons than almost any other footballer, from dart throwing to a bathroom fireworks display, from training ground bust-ups to Page 3 girl frolics. On the field his antics have swept across the cyber landscape: his red cards, his fan altercations, his provocations, his bib woes; Balotelli is the Premier’s League greatest cult-figure, a controversy magnet with as much meme-potential as a cat with a pancake on its head. But however much fun Balotelli is, such a polemic figure needs to be brilliant to justify his selection and reward a manager’s persistence in such a high-maintenance character, to render him more than a comedy sideshow. But the Italian has not repaid that faith and his genius resides only in brief, fleeting moments that are as regular an occurrence as his flashes of madness. That said, Mancini has used his troubled star’s volatility to his own advantage, to deflect attention away from his own errors. Notably against Arsenal last season, Mancini kept his bubbling, brooding striker on the pitch and, inevitably, the young Italian picked up a red card for a mindless, rash challenge; the next day’s headlines were about Balotelli the hot-head, not Man City’s (at that point) decaying title challenge. Yet Balotelli had been a key component of City’s Premier League triumph. From his ‘Why always me?’ derby goal to the unnerving, match-winning penalties and, obscured behind Martin Tyler’s elongated vowel commentary of Agueroooooooo’s winner against QPR, an assist for the most important goal of last season. Only Dimitar Berbatov and the Cisse’s (Djibril and Papiss) had a better goals to minutes ratio. Balotelli looked to have matured further over the summer during Italy’s European Championship journey. A talisman for his side, he finished joint top scorer in the tournament and gave a series of masterful, bustling performances. It appeared to be a watershed moment: potential was realised, boy became man. Normally so nonplussed, Balotelli even shed a tear in defeat. Alas it was a false dawn. Balotelli returned from Poland and Ukraine unchanged, still petulant and uncontrollable. He remains the fiery, arrogant player who broke into the Inter Milan side four years ago and whose reckless abandon even Jose Mourinho, the great man motivator, could not curb. Both Mourinho and Mancini emphasise the team ethic, work rate, desire and shape, but Balotelli does not conform to such parameters. He plays on his own terms within his own bubble, his impulses supersede the requirements of the team. It is his selfishness, his lethargy, his lack of application which frustrates his manager most. With PSG hovering, the Peter Pan of football could be abandoned once more, passed on to another manager tempted by Balotelli’s unfulfilled potential. The perennially juvenile Italian has fallen to the bottom of Mancini’s attacking pecking order, not that he’ll care – Balotelli is as unconcerned as he is mercurial. Perhaps not even ten hat-tricks can save his Man City career now.